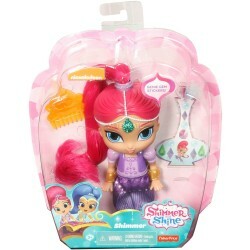 Shop Shimmer and Shine toys online. 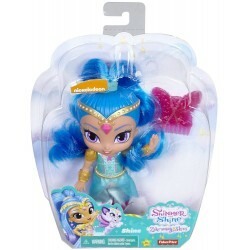 Buy Shimmer and Shine toys at great prices from Mighty Utan in Malaysia! Item: DYV95 Ages: 3+ YearsBeware of Zeta, the wicked sorceress. Item: FPV44 Ages: 3+ yearsGrant your little one's wishes with a beautiful Shine doll, inspired by the genie's newest adventures in Zahramay Skies, a magical world of fluffy clouds, glittering rainbows and new flying friends! 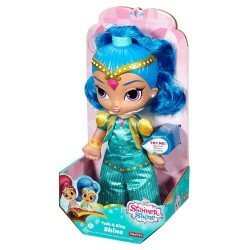 Item: FPV43 Ages: 3+ yearsGrant your little one's wishes with a beautiful Shimmer doll, inspired by the genie's newest adventures in Zahramay Skies, a magical world of fluffy clouds, glittering rainbows and new flying friends! 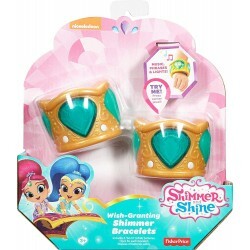 Item: DMD43 Ages: 3+ yearsPretend to grant wishes with your very own Shimmer and Shine™ magical bracelets! 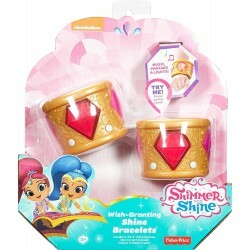 Item: DMD44 Ages: 3+ yearsPretend to grant wishes with your very own Shimmer and Shine™ magical bracelets! 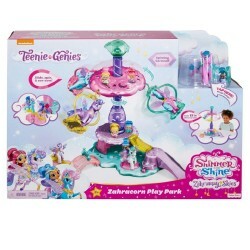 Item: FPW02 Ages: 3+ YearsWishes come true with a Teenie Genies playset inspired by the adventures of Shimmer and Shine in Zahramay Skies! 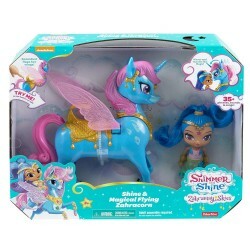 Item: FPV99 Ages: 3+ YearsTeenie Genies inspired by the adventures of Shimmer and Shine'in Zahramay Skies! This play pack includes Shine and her Zahracorn, Zoomdust! 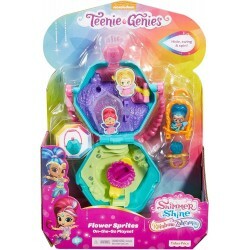 Item: FPW00 Ages: 3+ YearsTeenie Genies inspired by the adventures of Shimmer and Shine in Zahramay Skies! 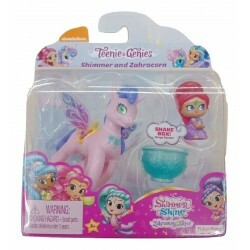 This play pack includes Shimmer and her Zahracorn, Zahrora! Item: FHN38 Ages: 3+ YearsSail through the Rainbow Waterfall into magical Rainbow Zahramay, a hidden world of new genie friends, mermaids, flower sprites and more! 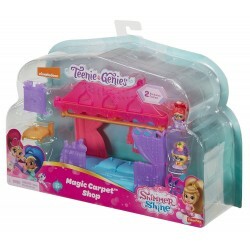 Item: FPV97 Ages: 3+ YearsTeenie Genies™ inspired by the adventures of Shimmer and Shine in Zahramay Skies! This play pack includes Rainbow Genie Rubi and her Zahracorn, Azah! 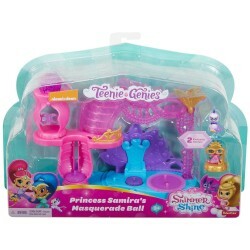 Item: DYW03 Ages: 3+ YearsLittle genies will love helping their Teenie Genies get ready for Princess Samira's masquerade ball! Item: DTK48 Ages: 3+ YearsBoom Zahramay! Let's visit the Magic Carpet Shop today! 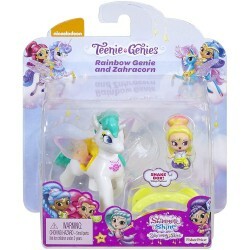 Item: FPV98 Ages: 3+ YearsTeenie Genies™ inspired by the adventures of Shimmer and Shine in Zahramay Skies! 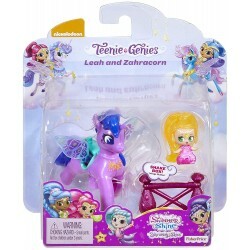 This play pack includes Leah and her Zahracorn, Zadazzle! 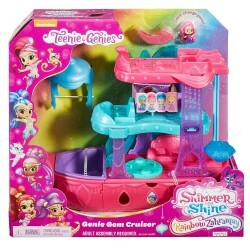 Item: FHP02 Ages: 3+ YearsInspired by the boat Shimmer and Shine used to travel into the colorful world of Rainbow Zahramay, this Genie Gem Cruiser is sure to bring magic to any little genie’s playtime! 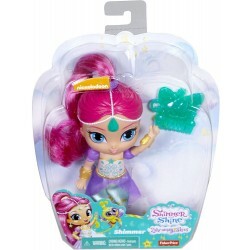 Item: DTK57 Ages: 3+ YearsShimmer and Shine, beach day divine! 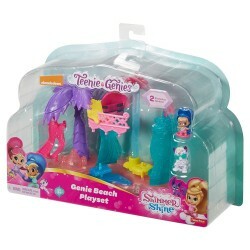 Little ones can pretend to join Shine and Nahal for a day of play at Genie Beach! Item: FHN39 Ages: 3+ YearsSail through the Rainbow Waterfall into magical Rainbow Zahramay, a hidden world of new genie friends, mermaids, flower sprites and more! Item: DGM07 Ages: 3+ YearsIt’s a wish come true! Talk and sing with Shine! Item: DGM06 Ages: 3+ YearsIt’s a wish come true! 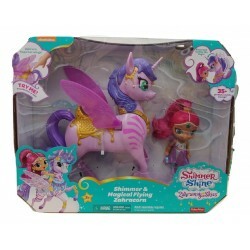 Talk and sing with Shimmer! 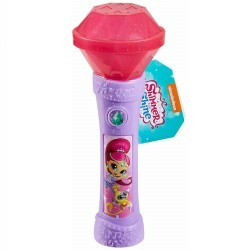 Item: DNF05 Age: 3+ YearsA magical Shimmer and Shine™ microphone! What more could you wish for? Item: DLH57 Ages: 3+ YearsMake playtime a magical adventure with your genie divine, Shine! 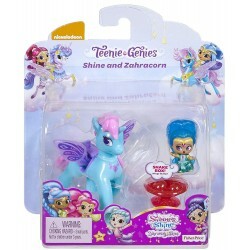 Item: FVF91 Ages: 3+ YearsMake your little genie's wishes come true with Shimmer and Shine and their pet Zahracorns, Zoomdust and Zahrora! 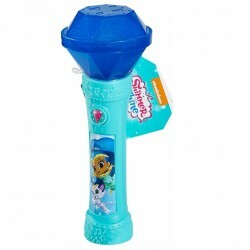 Item: DNF04 Age: 3+ YearsA magical Shimmer and Shine™ microphone! What more could you wish for? 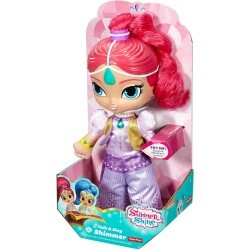 Item: DLH56 Ages: 3+ YearsMake playtime a magical adventure with your genie divine, Shimmer! 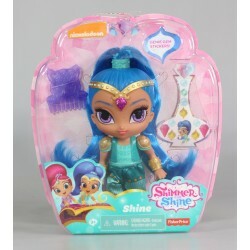 Item: FWH12 Ages: 3+ YearsMake your little genie's wishes come true with Shimmer and Shine and their pet Zahracorns, Zoomdust and Zahrora!